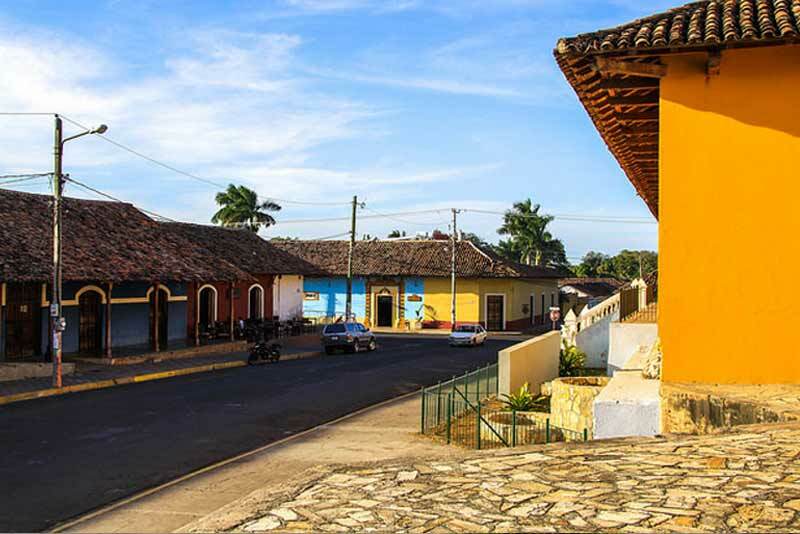 If you ever dreamed of retiring to an elegant city, where you can feel safe, and live in a beautiful colonial home then Granada, Nicaragua may be the place for you. Granada is not a crowded city. With a population of just over 150,000, it has most of the amenities you need and good health facilities. 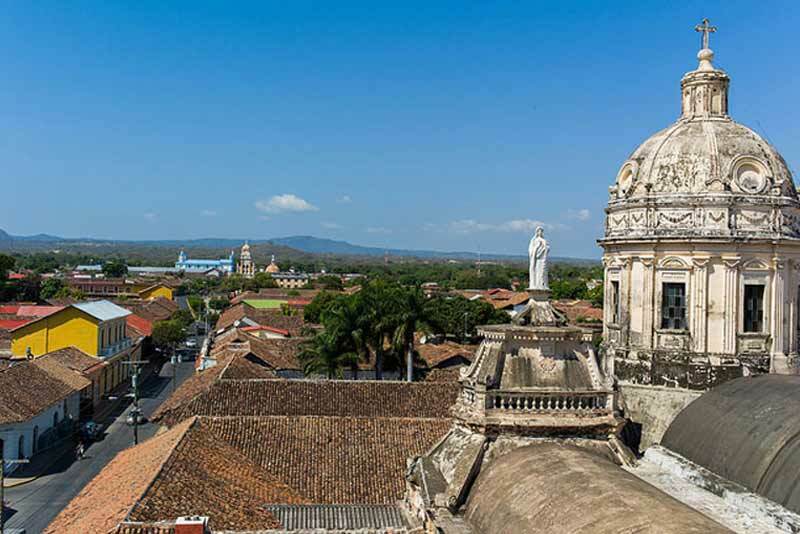 Granada sits on Lake Colcibolca (also known as Lake Nicaragua)—the 19th largest lake in the world—and its picturesque setting is anchored by the famous and much photographed yellow church in the city center. 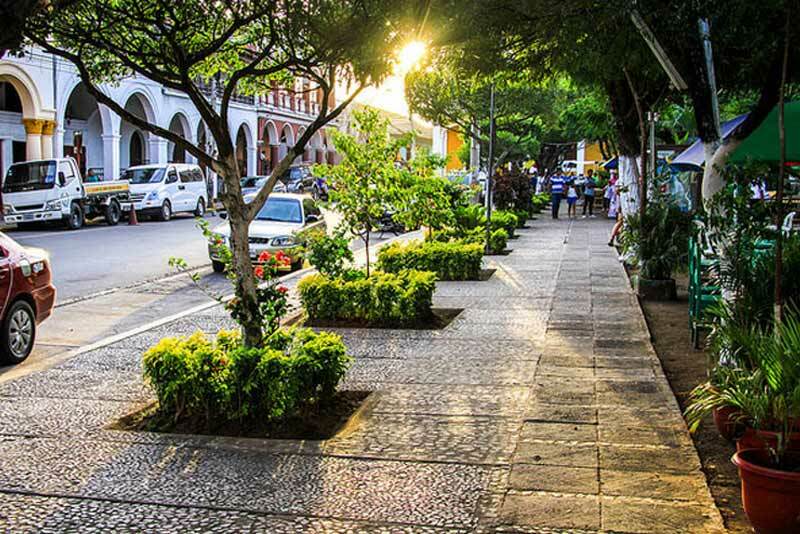 Sit on a bench in the central park in front of the church and you’ll see children playing; tourists strolling by the stalls where people sell beautiful Nicaraguan handicrafts, clothing, and jewelry; and horses clip-clopping down the streets, pulling quaintly-decorated buggies. At night, dine at your choice of dozens of outdoor restaurants on the famous La Calzada street, where you can enjoy 2-for-1 mojitos for $2.50, eat mouth-watering barbecued ribs while watching a break-dancing troupe, or listen to mariachis or someone who just feels like singing because it’s fun. People-watch and drink in the sights, smells, sounds, colors, and interesting people that are all part of the scene. It’s exactly what you would expect Nicaragua to look and feel like. Expats have flocked to Granada in recent years. For those not looking for Nicaragua’s beach vibe, Granada is a perfect blend of culture, beautiful avenues, and city life. With nearly perfect warm and sunny weather year-round, you’ll rarely even need a sweater. The large expat community will welcome you with open arms and you’ll find your calendar filled up with activities in no time at all. 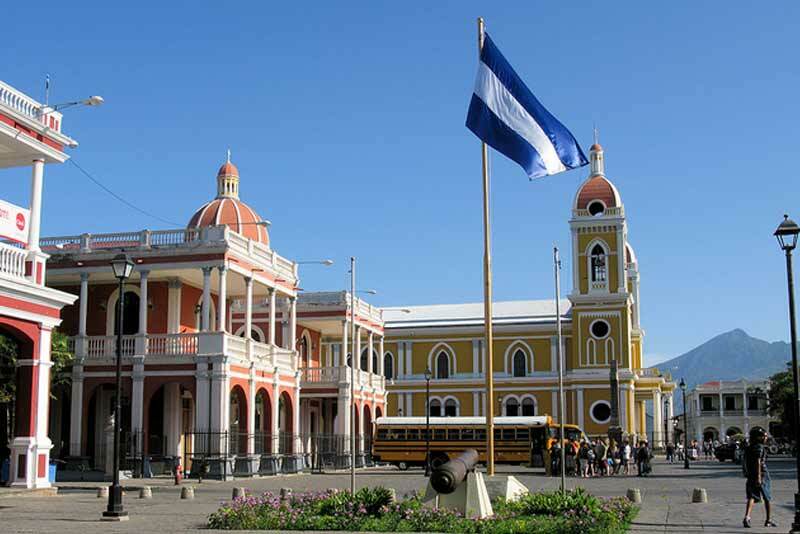 With all the foreigners who have moved to Granada, you’ll have no problem finding restaurants with your favorite comfort foods, as well as the usual international fare, and of course, great Nicaraguan dishes. There are several benefits of retiring in Nicaragua in general—and Granada in particular—that you may not have considered. Most people spend thousands of dollars a month to maintain their lifestyles in the U.S. and Canada. In Granada, a couple can live comfortably on just $1,500 a month, all in—furnished apartment, utilities, WIFI, food, and entertainment. Add to that the fact that you don’t have to keep up with the Joneses. In an expat community, most don’t care what you did before, how you dress, or even if you think differently. It simply does not matter anymore. You’ll be healthier because the Nicaraguan government does not allow GMO foods, nor does it inject animals, fruits, or vegetables with hormones, antibiotics or “plumping” chemicals. You’ll also walk more, probably swim more, and get more exercise in general. If you’re used to driving in rush-hour traffic and hate it, that stress factor won’t exist in Nicaragua either, unless you get anxious when a herd of cows decides to cross the street in front of your car! Many retirees worldwide worry about what they’ll do when they stop working. That might be a bigger concern if you remain in the same place you’ve always lived, with your same friends and family, doing the same things you’ve always been doing. But when you move abroad, the whole world opens up for you again, just like when you were young and venturing out into it the first time. And when you move to Granada, with its large expat population, you could have an even bigger advantage. Expats tend to look for and start activities that they can do together. You’ll find book clubs, water aerobics, dance classes, painting classes, shared excursions to Managua for a shopping trip or jaunts to other interesting places in Nicaragua, shared Spanish classes, meetups in restaurants, and so much more. In addition, there are many fun things to do in and around Granada. You can take a boat ride around the tiny islands known as isletas, stopping off at one for lunch, or even stay at one of the houses on an island for the weekend. There’s a great zip-lining experience on Mombocho volcano, close by Granada. Or go for a medicinal swim in the warm, volcanic waters of Laguna de Apoyo, only 20 minutes away. Art galleries, concerts, open-air markets, dining on the famous Calzada street, or meeting up with new best friends will surely occupy your time. You will not be bored in Granada. In Granada, a couple on a budget can expect to pay about $1,500 a month, which includes everything. A single person can do it on about $1,200 a month. Granada is the perfect place for people who want to live cheaply in an active and beautiful colonial city with a great climate, many food and activity options, and a large expat population. I have a bit of an embarrassing problem every time I go to Nicaragua. For at least half the first day, I’m constantly asking waiters to repeat the price for a beer, cocktail, or meal, thinking I misheard. Could it really that low? They give me a weird look and reassure me it is. Then there’s the next embarrassing part—I’ve just come from the ATM and only have big bills— that’s a lot of change, sometimes all they have in the register! After, I make sure to keep plenty of small bills on hand. The same thing happened to me on my latest visit, to the colonial jewel of Granada on the shores of Lake Nicaragua. I live on the northern Pacific coast of Costa Rica, and we like to head over the border for quick weekend trips sometimes. It’s just $50 and a five-hour bus ride to Granada on TicaBus, one of the many private bus companies that do the run. The bus is air conditioned, they play movies, and staff shepherd you through the border quickly. A steak dinner for three in Granada, with wine, at El Zaguan, an open air restaurant with live music on weekends (and you see your food sizzling away on the parilla, or wood-fired grill, in the corner), set us back just $45—and that was the most expensive meal we had. Try the steak with jalapeño cream sauce, by the way, it’s a traditional dish that’s just delicious. Vigoron, a Granadan specialty of yucca, marinated cabbage salad, and chicharron, or fried pork, paired with a tall glass of chicha, a corn-based drink, was just $4. Mojitos and other rum drinks, made with the pride of Nicaragua, Flor de Cana, were $1.50 around town. Ice cold Tona beer was 75 cents. Our room in Hotel Casa San Francisco, in a lovingly restored colonial building, was $65 a night. It was just two blocks from the heart of the colonial quarter: the Parque Central in front of the cathedral and Calle La Calzada, a pedestrian street full of restaurants, coffee shops, ice cream parlors, bars, art galleries, and cigar shops—all in restored colonial homes. Of course, dining and drinking on the cheap are far from the only reason to be in Granada. Just wandering the streets, I stopped every 15 feet to take a picture. The red tile roofs, the tranquil courtyard gardens glimpsed through grand open doorways (it’s like a secret is behind every closed door), restored homes, and the crumbling plaster on buildings waiting for someone to bring them back to life—a casual walk around this neighborhood yields many rewards for photographers. It’s a historic city. But by no means is Granada stuck in the past. It’s a thriving, bustling town. An estimated 1,000 expats live in Granada. And it’s not hard to see why. Low cost of living, a beautiful setting, and real estate is cheap too. Restored colonial homes with landscaped courtyards and modern amenities start at $200,000. I found fixer uppers in the colonial district on my recent trip from $99,000 and up for 4,000 square feet. But smaller one- or two-bedroom places, new construction, can be found for $60,000. Granada just feels so alive. It’s vibrant. Things slow down in the heat of the day—time to read a book around one of those quiet courtyards or hit the pool. But it picks up as people go out for evening strolls searching for a nice place to enjoy a pre-dinner drink.